Religiously active people also tend to smoke and drink less, but they are nothealthier in terms of exercise frequency and rates of obesity. 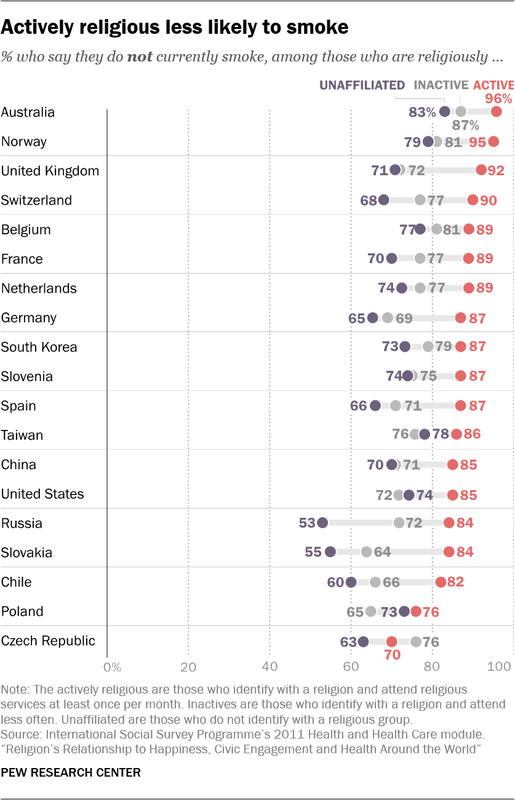 Nor, in most countries, are highly religious people more likely to rate themselves as being in very good overall health – though the U.S. is among the possible exceptions. 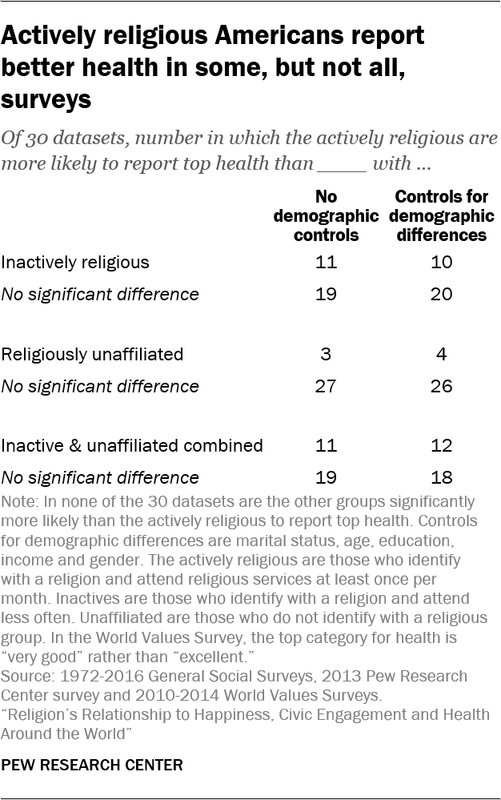 A Pew Research Center analysis of nationally representative datasets finds that in most surveys, there is no significant difference among actively religious Americans, the inactively religious and the unaffiliated in the share who choose the most positive option provided to describe their health (“very good” or “excellent,” depending on the survey).22 In fact, whether the actively religious are statistically distinct depends on who they are compared against, how self-rated health is measured and which datasets are used. 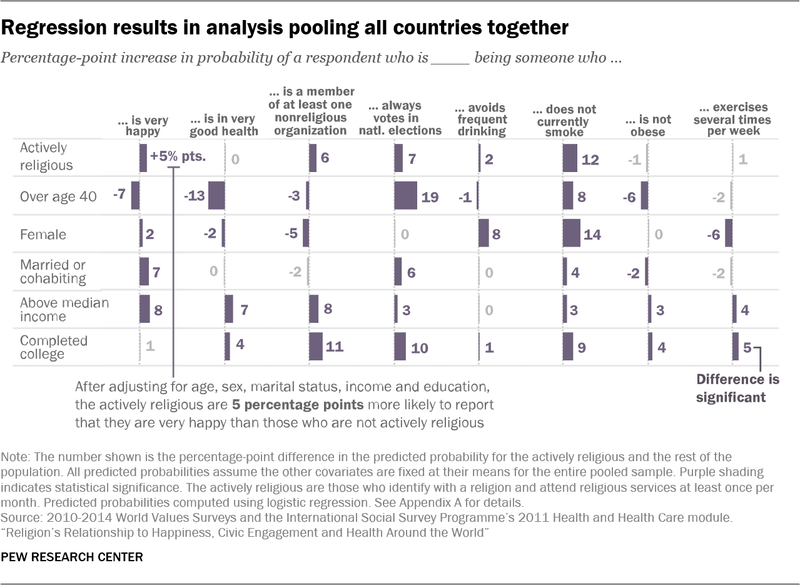 These results indicate that the relationship between active religion and self-rated health is not strong enough to consistently emerge across these U.S. surveys.26 However, the fact there is a significant positive relationship in some surveys, and never a negative relationship, suggests a tendency for actively religious Americans to rate their own health more positively than their compatriots. 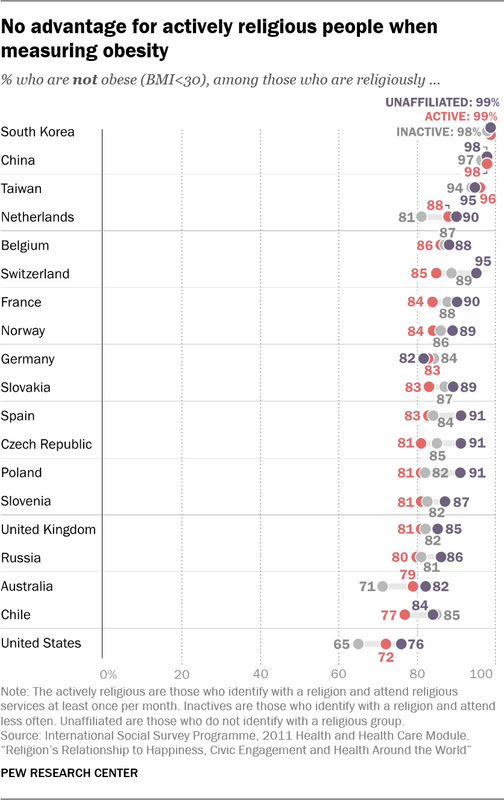 In nine out of 19 countries with available data, including the U.S., UK and Australia, actively religious people are less likely than the unaffiliated to say they drink several times per week.28 In nine countries, there is no statistically significant difference between the groups. 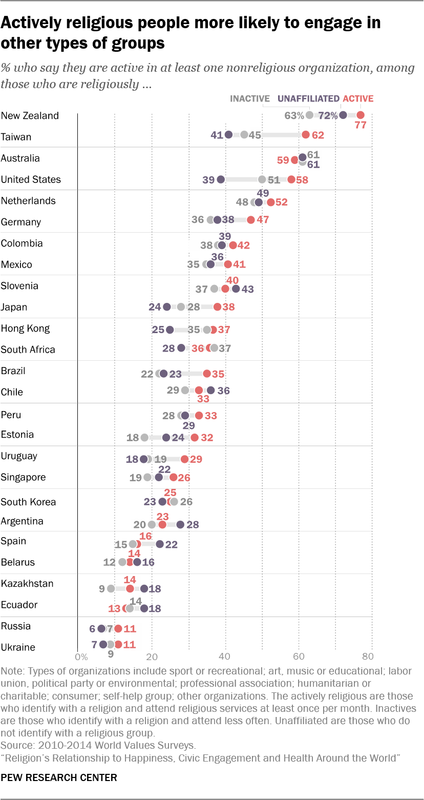 Actives are also less likely than inactives to say they drink several times a week in nine countries, and again, there is no significant difference in nine countries. 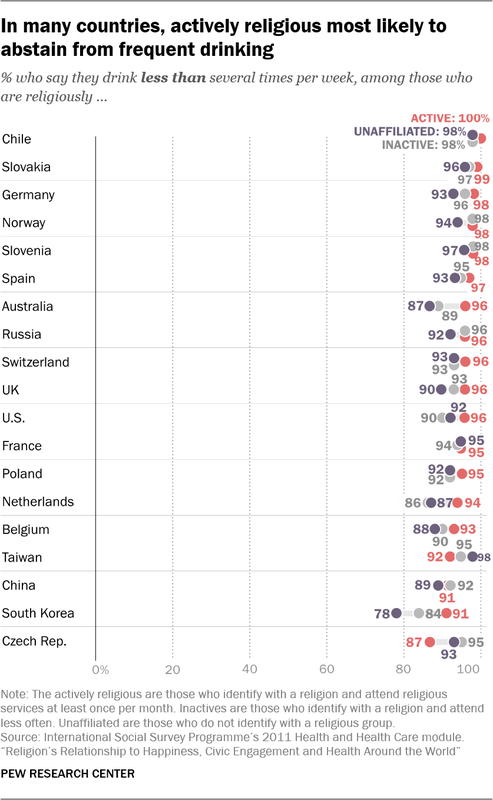 Only in Taiwan are actives more likely than the unaffiliated to drink frequently, and only in the Czech Republic are actives more likely than inactives to drink several times a week. 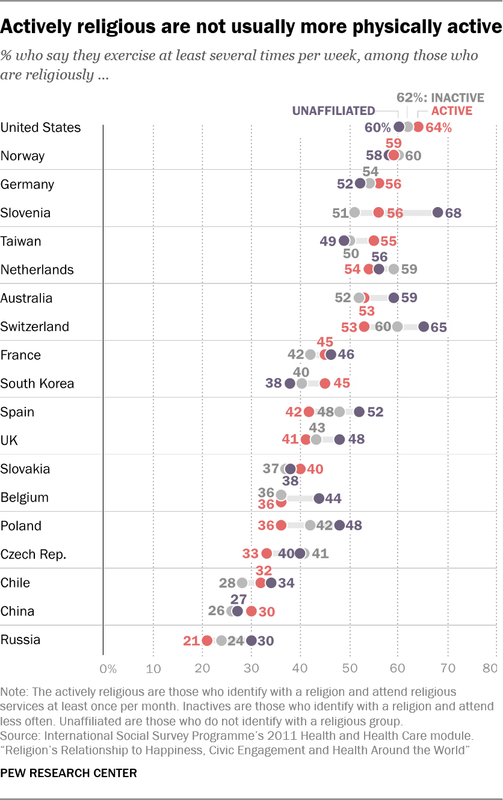 The picture is similar when examining obesity (body mass index calculated to be 30 or higher based on reported height and weight).29 Actively religious people are more likely than the unaffiliated to be obese in five out of 19 countries (the Czech Republic, Poland, Switzerland, Spain and France), while in the remaining 14 countries, including the U.S., the differences are not statistically significant. 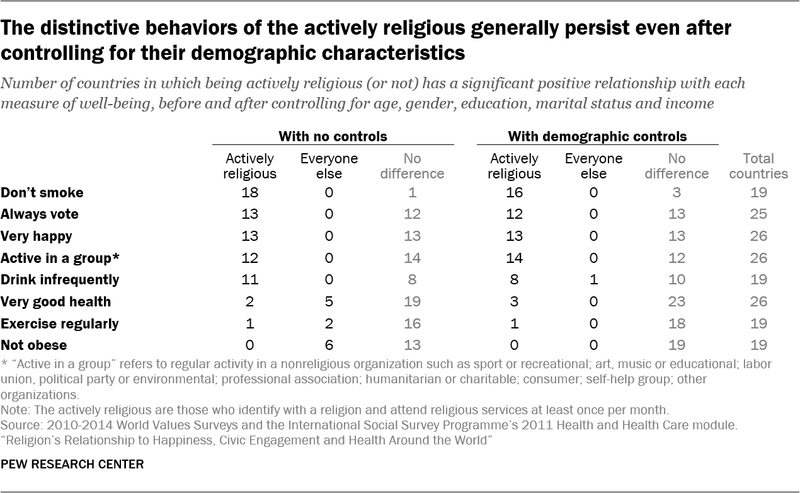 However, the U.S. stands out as an exception when comparing the obesity of the actively religious and the inactively religious: Religiously active Americans are less likely to have a BMI of at least 30 than are those who are affiliated but inactive. 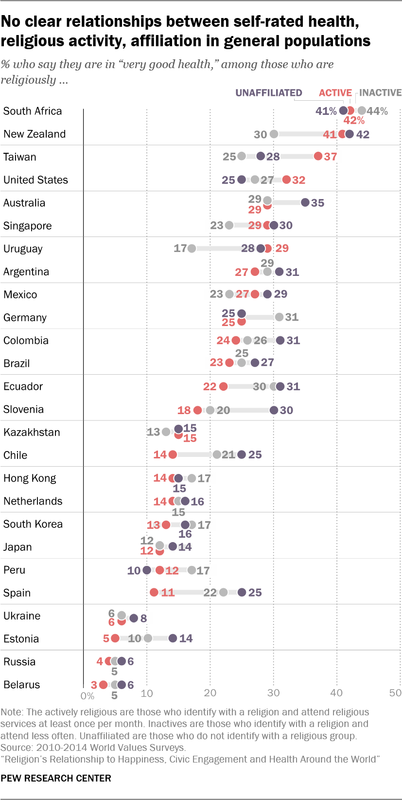 In Chile, on the other hand, actives are morelikely than inactives to be obese, while in the remaining 17 countries, there is no significant gap. 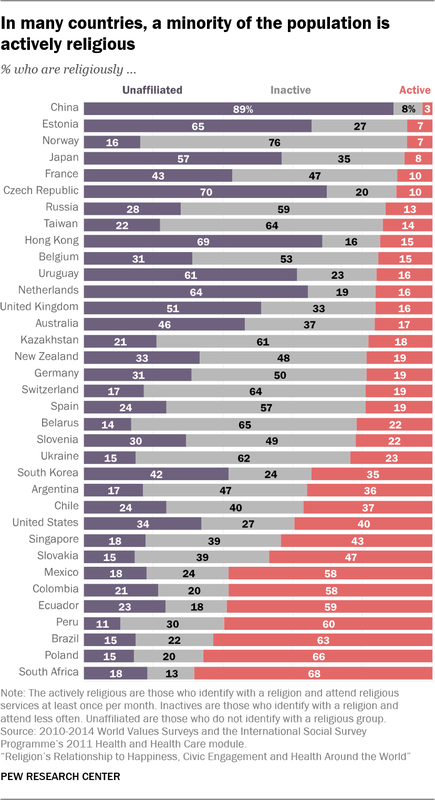 In addition, much of the research available relies on small samples – and research with larger numbers of respondents often uses samples that are not representative of the broader population.41 This includes studies of only older adults, only women or men, clergy, members of specific denominations, or people in specific regions of a nation.42 There also has been a disproportionate focus on mental health; far fewer research projects have looked at the relationship between religion and physical health. 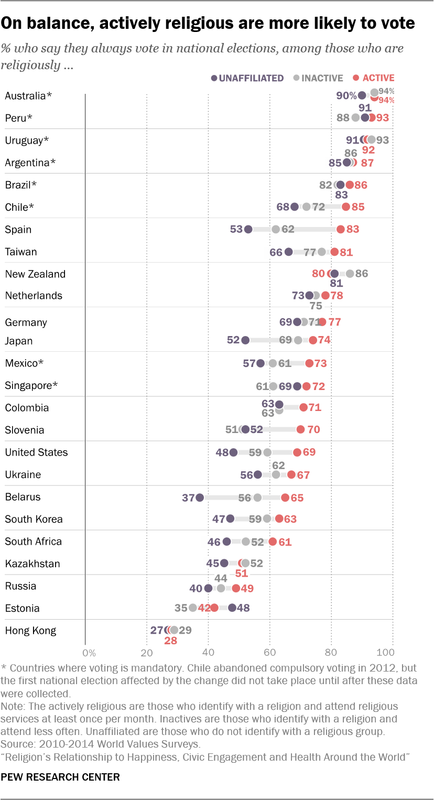 The table below shows the predicted effects of each factor in a pooled analysis of all countries in the datasets (26 countries for the World Values Survey measures and 19 countries for the items measured in the ISSP).51 In general, across all the countries analyzed, being actively religious is associated with a greater likelihood of being very happy, belonging to a nonreligious organization, always voting, drinking infrequently and not smoking. 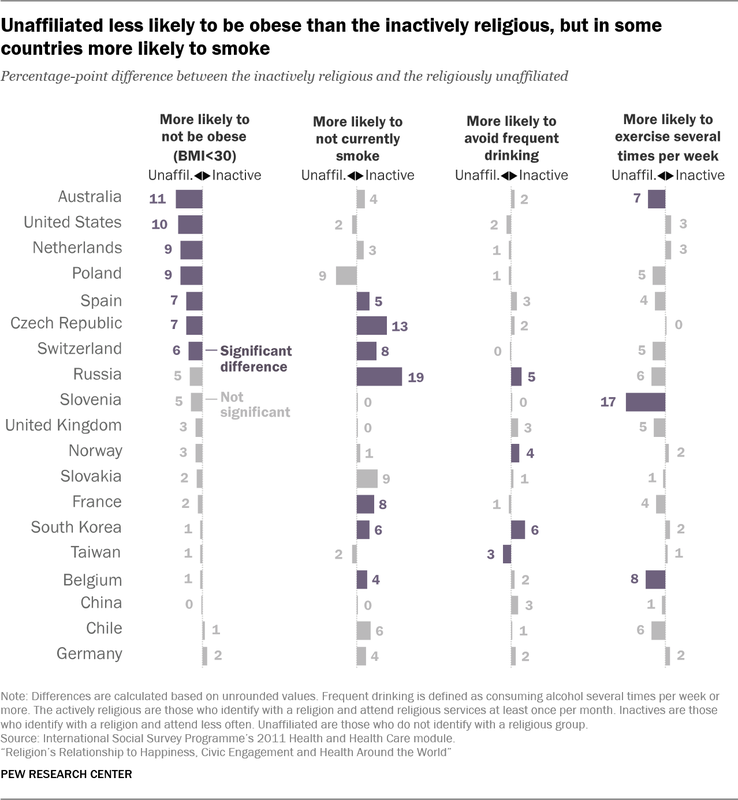 In this pooled analysis, the actively religious are not more likely to report very good health, nor do they have better outcomes with regard to obesity and exercise. These findings are broadly in line with results presented earlier in the report.